The yellow-gold and white (orchid) combination is a sight to behold. Our stunning Fancy Orchid Lei is crafted by the most gifted lei-makers in the industry. This exquisite lei is composed of over 1000 orchid petals sewn in a spiral, honey-comb fashion to create a magical and memorable experience. 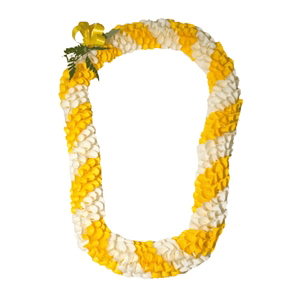 This is a spherical-shaped lei that is about 2 inches in diameter; perfect for both male or female. Our Fancy Orchid lei is set aside for the crème de la crème, cream of the crop, and VIP’s!